Let me register at the table, a design advice for PokerStars! Image 1. PokerStars poker table and chat. PokerStars can make it easier for players to join tournaments advertised at the poker tables! 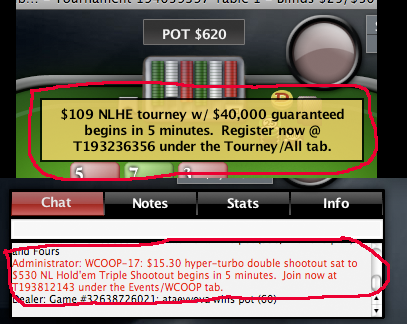 When I play at PokerStars I see information regarding tournaments soon to start in the chat window but also as a “banner” on the table (see image above). It is a real hazzle having to go to the tournament lobby and find the tournament so I don’t do it very often. A much better solution would be to let the player just click on the text in the chat window or the “banner” to open up the tournament’s lobby where I can register. This would be a pretty simple solution and I for one would register on a lot more tournaments.